One of the coolest party games you’ll find, but not much more… Yet. First impressions are everything for video games, and Melbourne-based developer Bit Dragon wastes no time in capturing gamers’ attention, taking the basic arena brawler premise and turning it into nothing short of a work of art. 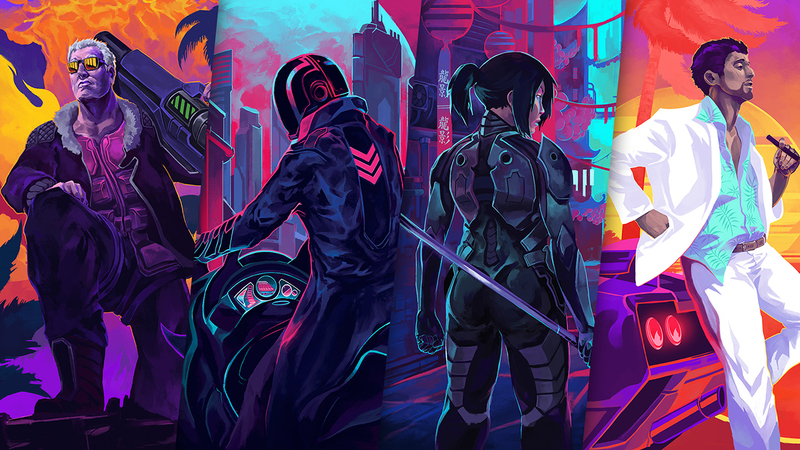 Hyper Jam is a neon-drenched nostalgia trip complete with a gorgeous ‘80s-inspired aesthetic, gameplay that harks back to yesteryear’s couch-based brawlers, and one of the coolest synthwave soundtracks you’re every likely to hear. Sure, the TRON aesthetic has been done time and time again to various degrees of success, but it’s absolutely phenomenal when it’s done well, and that’s exactly what Hyper Jam is. Once you get past the aesthetic (and the disbelief that something this pretty can come from a team of three developers), though, it becomes apparent that Hyper Jam is what Hotline Miami would look like if it was an arena brawler. Like Dennaton Games’ indie classic, Hyper Jam is fast-paced, full of energy, nuanced, and keeps you completely engaged until you switch it off. In many ways, it’s exactly what you’d look for out of a top-down, twin-stick brawler. Hyper Jam comes with a pretty simple premise: it drops you and up to three other human- or CPU-controlled fighters completely unarmed onto one of six small maps and tells you to fight to the death. There’s no rhyme or reason to it, there’s no goal outside of victory, there’s no backstory to speak of – unless you count each fighter’s one-word nickname – and there’s no differences to speak of between Vance “the Fixer”, Ghost “the Nightmare”, Max “the Veteran” and Yuki “the Lantern” aside from how they look. Max, the buff Duke Nukem lookalike, is just as fast as Ghost, the motorcycle-riding assassin, hits just as hard as Yuki, the sleek ninja, and has the same abilities as Vance, the Miami Vice-esque everyman; your choice of character is completely inconsequential, and the game’s lack of a backstory means that you’re not likely to find yourself attached to any of them. The control system isn’t too much more complex, either. Bit Dragon has enhanced the standard twin-stick shooter control scheme, where the left analog stick moves you around and the right analog stick spins you on your axis, with a basic attack that can be charged up for extra damage, a short dash to help you reposition around the map and dodge incoming attacks, and the ability to parry an attack away if you time it right. Keeping the controls simple – and reminiscent of brawlers of old – creates a game that’s quite easy to learn your way around, but the speed at which everything happens means that it’s not so easy to master. Hyper Jam also keeps the pace moving quickly by adapting the battle royale “shrinking circle” mechanic into its Sudden Death sequence, forcing players closer together if the match draws on for too long. Hyper Jam allays the repetition that can come with such a limited cast of characters by adding weapons and a fantastic perk system into the mix. One of four weapons spawn onto the map at random – but quite frequent – intervals, allowing you to mix up your play style: the katana allows you to get up close and unleash a flurry of attacks in rapid succession; the war hammer sacrifices speed for extra damage; the grenade launcher’s projectiles can bounce off walls and obstacles; and charging the rocket launcher before firing enables it to lock on to an enemy for a near-guaranteed hit. These weapons will disappear after a few uses, as well, ensuring that you can’t just pick a favourite and hold on to it and forcing you to use them only at the best of times. You can also throw your weapon at an enemy in a pinch, sacrificing damage but adding to the unpredictability. The gameplay is incredibly smooth and enjoyable, but it’s not until between rounds where Hyper Jam really comes into its own. The game offers a draft-based perk system that sees each player – in score order, from last to first – choose one of X perks (where X is the number of players in the match) to modify their stats and further tinker with their overall play style. The system allows you to gradually build your character in one of many directions: you can choose from perks that increase your movement speed, reduce your attack or dash cooldowns, buff you even more when you’re low on hit points, allow you to heal yourself either passively or upon landing an attack, and give you the ability to freeze, burn or “confuse” your opponents. You can also level the perks up by selecting them after separate rounds, ensuring that there are literally hundreds of perk combinations to choose from. If there’s one complaint to make about Hyper Jam, it’s that there simply isn’t much to explore. There are six maps and four characters, and although you can unlock skins for those characters, that progression isn’t character-specific and so there’s very little progression at all; there are no character-, map- or weapon-specific challenges, there’s no way to improve the characters and create any diversity, and there’s not much to do outside of jump into the game and play. Hyper Jam is truly a fantastic video game, and there is so much scope for improvement should Bit Dragon look to explore it, but for now it’ll go down as little more than a party game – one of the best party games you’ll find, but a party game nonetheless. With its fast-paced gameplay, neon-soaked aesthetic and one of the best soundtracks you’re likely to hear for some time, it’s hard to believe that Hyper Jam came from a three-person team. Unfortunately, the lack of content on offer at launch means that – until Bit Dragon releases some updates – it’s not much more than a quick party game. Jake reviewed Hyper Jam using a retail PlayStation 4 code provided by Bit Dragon. Jake is Doublejump's Editor-in-Chief. His goal for Doublejump is to break the stigma that inexplicably surrounds video gaming, and he'll work day and night to make it happen. He's also an avid sports fan who loves his food and watches far more home improvement shows than anyone would care to admit.